Today, I’d like to dive into greater detail on the first lever – Sell more. Selling more can be a real challenge for insurance carriers. 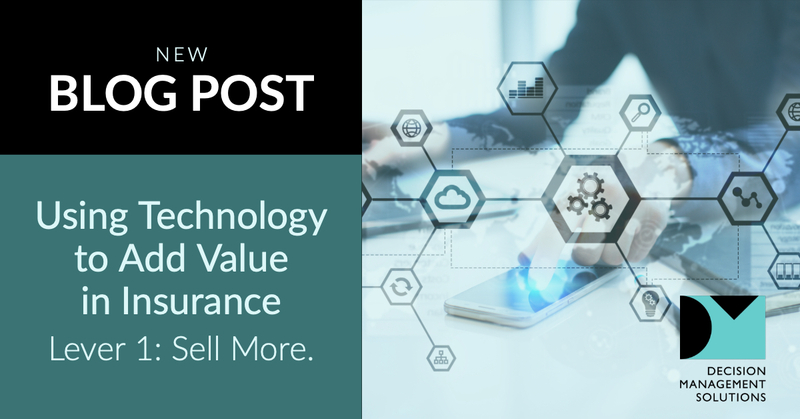 The fact is that most carriers’ interactions with customers are limited to an initial policy purchase, handling a claim or other customer service-related issue, and policy renewal. The carrier therefore needs to be extremely strategic about those interactions. The offers that are integrated into those conversations need to optimize each opportunity to cross-sell and up-sell the customers into higher value products and services, while ensuring those offers are relevant and valuable to the customer. In addition, they want and need to retain as many high-value relationships as possible. Adding to that challenge are the hundreds, or even thousands, of agents with whom to coordinate these offers, and ensuring that customers are only made offers for which they are eligible. Carriers know that leveraging customer data and predictive analytics at the individual customer level is the best way to drive new revenue, build loyalty, and increase customer retention rates.Engaging and growing relationships with younger consumers is a particularly important part of many carriers’ strategic objectives. Integrating these business objectives into a complex operating environment, however, can be a real struggle for many organizations. That’s where Next Best Offer (NBO) technology (also called Next Best Action (NBA)) comes into play. NBO is an increasingly accepted approach to improving the targeting and effectiveness of marketing in consumer-facing industries, such as insurance and retail banking. When done well, NBO provides customer-centricity, cross-channel coordination, an improved customer experience, and superior service levels. In short, selling more. Replacing product-specific and channel-centric marketing with centrally-managed and curated offers ensures each individual customer receives the right offer, while preventing your best customers from being deluged by multiple offers for which they qualify. An NBO program can include non-marketing actions so you can build long-term customer relationships and improve customer service in parallel with cross-selling, up-selling, developing and retaining valuable customer relationships. Well executed NBO programs enable carriers to upsell and cross-sell customers at the point of initial policy selection, when the customer is on the customer portal, and in nurturing or maturity campaigns. NBO programs can also be aligned or fully integrated with agent productivity and effectiveness programs, as these are also about selling more. NBO at the point of sale is a great way to boost the annual premium equivalent (APE) and especially new business profit (NBP), as there is virtually no additional cost of sale. One CFO describes this as almost like picking free money off the floor! Another carrier has a successful upsell rate of 14-24% depending on the product and has added millions of dollars in APE the first year alone. This topic also touches on improving persistency and retention by deciding on the right approach to help insurers retain revenue and so avoid having to sell replacements for lost customers. Finally, maximizing customer relationship value goes beyond successfully implementing a solid NBO platform. Automating your underwriting process also has a significant impact on booking more business. Some customers will be lost if underwriting takes too long or asks for too much follow-up information. Automated underwriting can close those deals now, boosting the APE by saving customers who would otherwise be lost. Previous Post What is an Acceptable Analytic Failure?